Now that I’ve been DMing again for a while, and having read copious amounts on the way of Old School, a conundrum has presented itself to me. It is quite feasible that a player with a slightly higher than average intelligence, may well play a character who has, let us suppose, an INT of 17 or 18. Clearly, the character is more intelligent than the player. So what happens when, as is common in dungeons, the DM wishes to present a puzzle challenge? One approach might be to say that a roll under INT on a d20 would mean that the character has solved the puzzle, but this goes against the maxim of Old School, ‘challenge the players, not the character’, and indeed reduces what is often a key feature of the dungeon to just a die roll. So how should this problem be approached?  Test the player – sure, but doesn’t this mean that the character’s INT score becomes rather meaningless as an indication of their intelligence.  Abolish intelligence as a requisite – good idea on the surface, but doesn’t this mean that the Magic User then becomes a very difficult class to run as it no longer has a prime requisite.  Ban players from running characters above their natural intelligence. Tricky one this. It’s almost like a kind of intellectual discrimination and besides, who judges player intelligence? It's a minefield, to say the least. INT is not like STR. You can say I’m kicking a door open, or I’m bending the bars, and no-one expects you to actually do it. The DM might get a bit annoyed if the doors in his house are routinely broken off their hinges by players with the equivalent of 18/00 STR. "4. At least one puzzle, trick, or obstacle that requires the players to figure it out, rather than being solvable by a die-roll"
They are something that either the player solves or the character does, and if the character does, then it revolves around a die roll, or the DM saying that the puzzle is solvable with the application of, say, 30 INT points. And what if the DM is hopeless at making up puzzles? He might present the players with the D&D equivalent of the Gordian Knot or leave the main treasure chamber guarded by a problem that Elmo from Sesame Street could solve. As a converse example, what if the player is running a fighter whose INT is way below his own? Is it fair to ask the player to restrict his own intellectual input into the game, just because his dice rolled low? Or should the DM ask someone who may not be capable of it, and would find it immensely frustrating, to role play a dimwit? Junior Grognard is 6.5 years old and there is obviously a point beyond which his deductive powers are not, as yet, capable of going. I had to put on my thinking hat in one of our Training Dungeon sessions recently and devise a puzzle that would reward the players whilst not relying on the characters to make die rolls. However, as there are two magic users in the party, it stands to reason that the characters, realistically speaking would have tumbled the puzzle in moments. JG got it, but it took a while and a good deal of effort. The temptation is strong to ‘help’ the players if the DM suddenly realises that the puzzle is just too tricky for them, or if he’s overdone the complexity thereof. Tempting though this course of action is, it has the potential to ruin a dungeon. But players might very well complain if they realise, as has been outlined above, that their characters could well have solved the puzzle that the players could not. And not everyone is good at logical puzzles, although they might be very intelligent in other areas. 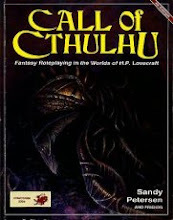 I would certainly be interested to hear how other DMs have solved this particular problem and if anyone’s got examples of puzzles that can be placed into dungeons to give players a tough but ultimately feasible chance of solving them. Talk to the axe - 'cause the dwarf ain't listening! From previous sessions, it will be recalled that the party was approaching room 7, haunt of the water weird. They all filed in and spotted the treasure under the water, but sensibly didn't disturb the pool itself, being more interested in the door on the far side of the room. They opened the door, no traps there, and found within a statue of a nymph, her feet encased in the stone of the plinth. As they approached the statue, a magic mouth appeared and recited the following rhyme. Aid in your struggle with the watery snake. JG put two and two together about the watery snake, concluding that the bones in the pool were indeed its previous victims. They set to smashing the pedestal and as the statue’s feet were freed, it turned into a woman made of water, who then cascaded to the floor and flowed into the ground. In the rubble, the party found a flask which, although they didn’t know it, contained a potion of purify water. JG at once realised that it could be used to fight the water weird. From there, they managed to find their way down towards room 5, where there lay in wait a bubbling pit of green slime. There were two narrow walkways to a platform, ten feet by ten feet. I should add at this point that JG had got Alia the MU to memorise unseen servant. They arrived at the 'northern' door, the walkway from which required only one Dex check to reach the platform, rather than the ‘western door’ which would have required four. Hruthnor, Alurax, Akurath and Lannius went across, Lannius missing one roll and making his balancing roll just in time. Ten feet across the slime was a wall carving, in the middle of which appeared to be something resemblign a tiny keyhole. They managed to work out, with a little help from Daddy Grognard, that they could use the ten foot pole to get one of Lannius' tools across to the panel with the keyhole, but although Lannius made his pick locks roll, they had no plan in place to catch the gems and they all plopped into the green slime. At least no characters went with them, although Lannius was sent on the Walk of Slime back to the 'western' door, and this time managed to make his DEX roll four times. Some time later, JG was reminded that the MU had unseen servant and had he remembered this, I would probably have ruled that said servant could have caught the gems. He wasn't too happy when he realised this. Having had the completed sections on the map filled in for him, JG set off again, this time up the winding bit towards the skull and hands room (3 & 4). As they rounded the bend, they came face to face with three wandering orcs, who waded in with cries of "Death to the humans" (well, something like that, given that the two lead characters were a dwarf and an elf - not too bright, those orcs). The resultant melee was quite bloody, with Alurax going down and Hruthnor being reduced to 1hp. Elise the C/Mu got a cracking hit in with the lucerne hammer, more or less smashing one orc's skull to bits all over the wall of the passageway. But the orcs were eventually sliced and diced, and on went Team Adventure. They got to the junction and spotted two shadowy figures up by the crossroads. It was two goblins with bows, keeping an eye on things for their mates in room 2. I had planned for them to send a couple of arrows in the party's direction and 'persuade' them to move on to rooms 13 and 14, and the descent to the next level. However, things backfired and JG ordered a charge, with Elise and Lannius in the vanguard. A couple of arrows whistled past them and battle was joined. To cut a long story short, more and more goblins joined the fray from room 2 (you will remember that there were originally 21 and 4 had been slept and killed by Team Adventure in session 1, leaving 17). One by one the party members were brought down to minus HPs, and were dragged back to be brought round by Alia the MU. First Elise went down, followed by Akurath. Hruthnor was being kept on the bench by the manager, having only 1hp to begin with. In leapt the hobbit, holding the breach, while Lannius (with AC2) was dodging the goblin blades like Jackie Chan. Then the hobbit took 8hp of damage and was at -6. Despite only three goblins left, JG was looking at the likelihood of a TPK. It was time for the arrival of a saviour with a bendy sword and a fresh set of HPs. "Need any help, human?" he asked, and when the answer was in the affirmative, he weighed in and the party (well, what was left of it) finished off the remaining goblins. It was a very long and epic combat, a real old-fashioned meat-grinder with a lot of rounds where no-one actually hit (this often happens at 1st level). I did give JG a couple of chances to leg it, but he stuck with it and managed to wipe out all the goblins in the TD. Result! 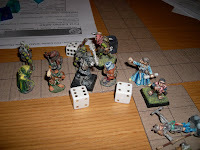 The newcomer was a half-orc Cl/Th named Garazor, supplied by my good buddy Old 4 Eyes, who had been following the adventure by e-mail and wanted to vicariously participtate. Following Garazor’s advice, they are now hunkering down in room 2 for the night. They'll need at least 8 hours, for the respective clerics to get their cure lights back, get the hp levels back up and restock on spells for the next session. Which will contain a tough monster indeed, although the sheer dogged determination that JG displays makes me think that he is a dwarf at heart. The nymph’s riddle went well. I was concerned that JG might not work it out, but he seemed to get it with a modicum of effort. Wandering monsters caused some problems and the DM's plans went slightly awry, although it ended the session with a melee to remember. I was very pleased that we didn't get a TPK at the crossroads, although there were some very lucky rolls that avoided that and the timely arrival of a certain half-orc. There is a very good reason why these guys might look a bit worried. If it scores 18 or better on a hit with its paw, it has dragged the victim to itself and will do it 2-16hp per round hug damage until it is killed. There is a 20% chance that each owlbear will hit the bulette, whilst the bulette has a 70% chance of hitting. An owlbear would have to hit a bulette seven times to have a chance of killing it. Since there is only a 20% (1/5) chance of this happening and an owlbear per round will be killed 70% of the time, it stands to reason that 5 owlbears are needed to ensure that proportionally, one gets a hit in. Since that hit will only do on average 1/7 of the HTK for the bulette, we’d need seven times that many to ensure that the bulette will die. So that’s 35 owlbears to one bulette. Or maybe that’s just my dodgy maths. Okay, so we’re ready to do….. Bite 11 hit. I rolled 3, 11, 7 and 10 – that’s 31 damage with the bite alone. In total, the bulette has inflicted damage of 51 points of damage on the unfortunate owlbear 1. A definite kill. 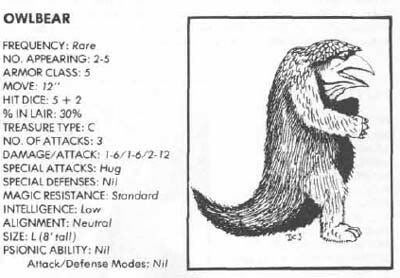 In total, the bulette has inflicted 13 points of damage on the unfortunate owlbear 2, reducing it to 12hp left. So none of its attacks hit that vulnerable area of AC6. Let’s see if they get through the bulette’s armour this time. Round 3 – so now we’re down to one owlbear that’s taken damage, and the bulette has still taken no damage. In total, the bulette has inflicted 22 points of damage on the unfortunate owlbear 2. It’s dead meat. Dinner time for the bulette. Claw To hit AC6 is a mere 9 or better, so here goes – 10, yes it’s a hit. Damage of 5, so that brings the bulette down to 35hp. Whew, that’ll teach him to take on two owlbears at the same time. Okay, so that might have been a fluke. Let’s do it again, just to be sure. The first owlbear has taken total damage of 39 points of damage from the bite and claw. Not quite as much as the 51 points in the first battle, but still enough to kill the owlbear outright. The bulette does 18 points of damage on the unfortunate 2nd owlbear, leaving it with 7hp. Looks like there’ll be an empty place or two at Mr and Mrs Owlbear’s dinner table tonight. So once again, none of its attacks hit that area of AC6. I wonder if they get through the bulette’s armour. What do you think, readers? Oh dear. Those claws are just bouncing off the bulette’s scales. No wonder they’re so prized as shields. Just the question of getting them off the bulette in the first place. Round 3 – so now we’re down to one owlbear with wounds, and the bulette is just laughing at it. Claw 16 - hit for 10 damage. The bulette has done 10 points of damage on the now late and lamented owlbear 2. It’s dinner time for the bulette. No attack hits the vulnerable AC6 area but wait, what’s this? Bite 18 – the owlbear fastened on with its beak before it died, doing 7 points of damage. Okay, so the result wasn’t a fluke. So, this is proof conclusive that two owlbears are no match for a bulette with an attitude. That’s more or less any bulette then. Thanks to Carter Soles for pointing me in the direction of two meaty monsters, who will be gracing the encounter tables of my sandbox for quite a while to come. As I’m going to be running a sandbox in my campaign world, and will be making references to the world and its history, I thought that it would be a good idea to introduce it and its creative process, as well as many of the events, personalities and such like that exist therein. Ever since I started to reactivate my interest in D&D, I had known that I would need a campaign world. I enjoy world design, so much so that I could do it all day as my good buddy Old 4 Eyes knows (and if anyone wants some world-building sub-contracted, I’m your man). 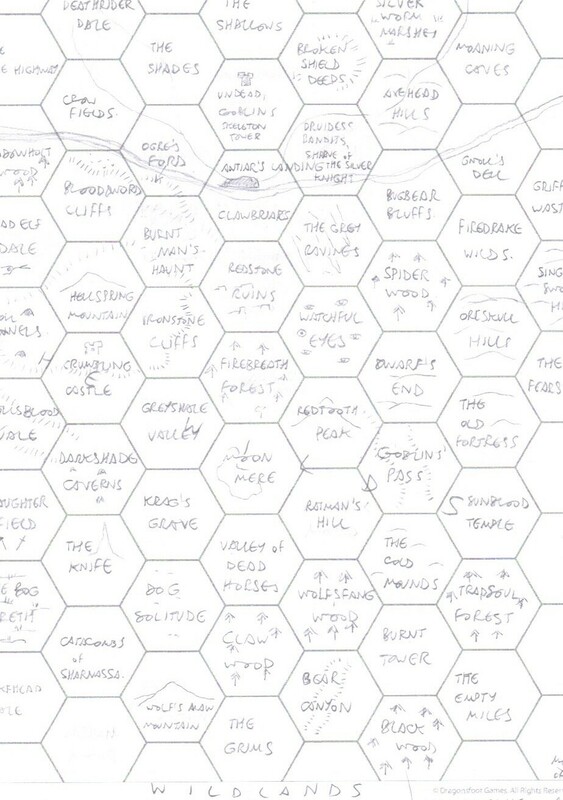 So, rather than start with a blank sheet of hex paper and work out from a starting base, I wanted to get the world sketched out and then zoom in, making progressively more detailed maps until I had an area that I considered was suitable for setting the sandbox in. There’s been a lot of talk just recently about the virtues or otherwise of keeping the campaign focused, of not creating more than you have to, of too much detail cramping creativity. This may well be true for some DMs. However, as will be seen, the size of the world that I have set about creating is such that months, if not years of creating detail will never fill it to the extent that there is nothing more to say about it. With reference to an example, I know – thanks to my world history – that 360 years before the present, the Iron Legion, an army of vengeful dwarves set off to liberate their mountains from a horde of humanoids and were never seen again. That’s all I need to know at present. That’s the level of detail that I want to have when working on my campaign. I can now drop hints and suggestions into play without having to write a 100-page story about what happened to the Legion. I’m sure that I’ll find out. But I had to have that initial detail done, so that future creations ‘on the fly’ don’t contradict what I’ve already created. Otherwise, the entire campaign might as well be run on retcon. A young civilisation, rising from a period of chaos and war. A long-fallen empire of evil magic. A wide variety of terrain types and landscapes. Wild, humanoid-infested wilderness where hard-pressed humans strive to hack a civilisation out of the chaos. Settled lands – a wide valley of little kingdoms and baronies, all with the potential for conflict if need be. A doughty fastness from which adventurers could go off to explore the wildlands. Explanation for the animosity between dwarves and elves. Towering mountains beneath which swarm countless multitudes of humanoids. Mercantile city port, full of travellers, adventurers, freebooters, rogues – a bit like Lankhmar. Stronghold of magic, wisdom and lore. Fallen and ruined cities, full of peril and ancient treasure. Major city, the nexus and hub of all goings on in the world – comes complete with ruined city and dangerous sewers and catacombs. Hobbit nomads – the diametric opposite of Tolkien’s homebodies. A dark forest where evil secrets lurk. A tough clan of warriors with super-sharp swords who fell against the forces of evil many years ago. Clans of elves, taking a paternalistic and distant view of the human johnny-come-latelies. A sinister band of assassins and spies who have been driven underground (but not defeated) by the forces of good. A lost cavern complex infested by undead but home to fabulous riches. Dragons to be a natural predator menace, but not some organised force for evil. I also wanted a milieu into which any of the existing modules could be dropped if I needed to use them. For example, I needed mountains for the G modules, a string of islands where a slaver confederacy lived for the A modules, a recently vanquished evil cult for T1-4, a large marshy area for the location of Tomb of Horrors, etc. After a couple of abortive attempts at drawing up a world map, both of which failed to pass my notoriously self-critical standards, I went back to the drawing board and started to google ‘world building’, hoping that there was some advice on the net. For sure, I found a lot of how-to and step-by-step sites, the advice in which I absorbed, but then by serendipitous chance, I came across the website of Chris Wayans, a site that I thoroughly recommend to world-builders and anyone interested in speculative geography. Chris takes Earth and spins it through a number of different scenarios, from extreme global warming resulting in a rise in ocean levels, through a steady-state ice age, an Earth turned over on its side, and an Earth wholly inverted. I’ve used several of the images to prompt continent-building for the campaign world of my good buddy Old 4 Eyes, for whom I am doing some cartographic design work. The results of Wayans’ experiments are fascinating but what caught my eye was on the world named Jaredia (for Jared Diamond and his book Guns, Germs and Steel) a map of an ice-free Antarctica. The more I looked at it, the more it started to feel as if I’d stumbled across a serendipitous nugget of inspiration. It seemed to have everything I was looking for and seemed to be about the same size as Greyhawk. I could hear the sound of boxes being ticked. Using some rather low-tech devices, like tracing the map onto plain paper by holding both up against a window on a sunny day, I soon had a version that was ready to be fleshed out; very little work was required to turn the original Wayans map into my own campaign world. For a long time, it had no name, but I thought recently that if I was going to share it with others on this blog, it was going to have to be named. And a few shuffles of letters later, its title came to be. (my apologies for the cropping,as I'm only just mastering the art of scanning to jpeg). In the next post in this series, I’ll be zooming in on one particular part of the world and explaining how I set about making the sandbox. A warm Daddy Grognard welcome to my 11th follower, Carter Soles. Carter's Cartopia is excellent reading, and I'm looking forward to hearing more of the Lands of Ara. From what I've seen so far, it looks like it's going to be a great setting, fizzing with good ideas, many of which might 'migrate' (ahem) to my campaign. Like yourself and Chgowiz, I am an adherent of the immediacy and proximity of deities to their clerics, although it might not work that well with kids. They have a directness of approach and a lack of subtlety which, if mixed with D&D religion might lead to doctrinal conflicts that would put the inquisition to shame. Oh, and Pebbles the cat says "Hi Charlie"
We started at room 11 (see map above), where, as you'll remember, the party was holed up at the end of the previous session. JG decided to get the two wounded characters healed up with Elise's two remaining Cure Lights. Then, rather than wait another four hours to get the two clerics full of Cure Lights again, he set off for the crossroads and room 9. A quick instruction about ten foot poles and checking for traps and they were in. Inside the room was a set of strange carvings on the wall at the point marked A. The party approached the carvings but despite my putting a pressure pad trap at X, perhaps assuming (counter-intuitively) that the party would not walk straight down the middle of the room, that's just what they did. Ah well, sometimes DMs think too far ahead of the party. The trap would have closed the door to the corridor. A strange chanting would have started, and the carvings would have been illuminated by an eerie phosphorescence. In order to open the door to the corridor, the party would need to solve the puzzle, which required a total of 36 INT but there was a chance that even if they did this, the door to room 12 would open, allowing a horde of skeletons out. The four characters that stood at A, looking at the carvings had a total intelligence of 50, so it didn't take them long to work out what buttons to press, regardless of the fact that the door to the corridor wasn’t actually shut. However, they still managed to set off the part that opened the door from 12, and the skeletons were revealed. (I should add here that although one of the maxims of Old School play is ‘test the players, not the characters’, I have a problem thinking up puzzles and tricks that can challenge a player’s intelligence. I’ll be blogging on this soon). The two clerics (Elise, a Cl/Mu and Zhastar the hobbit) rushed forward and managed to turn eight of the fourteen skeletons advancing. The other six weighed in and it was a tough fight. First, the hobbit rolled a 1 on his to hit, so I asked for another roll and he got another 1. Footman's mace went spinning across the room. Elise was swinging left and right with her lucerne hammer, smashing bits and pieces off skeletons. Up stepped Alurax, about to find out the hard way about edged weapons and skeletons. Next round, down went the hobbit. Alia the MU dragged him to safety, and up stepped Hruthnor, deciding that half a battle axe is better than no battle axe at all. The doughty party whittled down the skeletons while the skeletons whittled them down. Alurax went next, and Lannius Light-finger moved in to fill the breach. Note the edged weapons here, not a good thing. Eventually the six skeletons at the door were despatched, but by now, the other eight were advancing again. JG chose to have Elise's cleric carry on with the lucerne hammer rather than try to turn them again and make a hasty retreat. Soon she fell to the bony advance. Hell, that MU was doing a lot of binding and resuscitating. Hruthnor, Lannius and Akurath Bladestrong finally managed to prove that while sticks and stones may break bones, swords and axes do just as well, only a little slower. A couple of criticals did help during the melee. 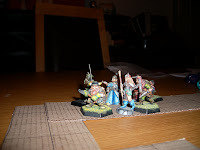 With the party licking its wounds and three of the seven on zero hit points, JG decided to take the three fit and standing PCs (who were all down on their HPs) off on a jaunt of their own, splitting the party. Lannius, Hruthnor and Akurath set off down the corridor from room 9 and turned down towards room 8. In there, they found four sleeping wolves seemingly guarding four clay pots hung from hooks on the walls. Lannius decided to try and do a move silently. He had a 20% chance but rolled 24 and the first wolf woke and went for him. At the sound of combat, the other wolves woke, but before they could all rush Lannius, the two dwarves had charged in and joined the battle. Well, you remember the lucky rolls last week. This week it was "the dice are trying to kill me". Wolves with 2+2 HD (HPs of 13, 13, 7 and 13 respectively) THAC0 of 16 (I thought that this was pretty good, perhaps too good but it was the figure from the summary at the back of the DMG) and the lucky dice this time were a bit too much for the dwarves with their ACs of 5, and they went to minus pretty quickly. All four wolves then turned on Lannius (AC2), who had the good sense to back into a corner, allowing only three to get at him. But alas, he too fell. At this point, JG (who is very taken with Hruthnor) burst into tears. I consoled him with some Daddy DM words of "It happens to us all, mate" and assured him that the three characters, it being a training dungeon, would reappear at the start again. Curiously, whilst the zero-HP characters were resting up the four hours to get their spells back and some chance of healing, I'd done some wandering monster rolls. In the first hour, the evil cleric lurking deeper in the dungeon and two of his zombies had passed by (no reason for him to go into what is in effect a ruined chapel when he knows that any dead bodies in there are going to turn into skeletons) and in the third hour, I got a roll for adventurers, so I deemed it appropriate that the three previously dead characters were the ones who happened by. Cure Lights at the ready, all characters back up to full strength, off they went, eager for revenge on the wolves. By now the wolves were not sleeping but were on edge - down the corridor came Team Adventure, weapons at the ready. I deemed that the wolves still had the damage from earlier, to make it a bit fairer on the team - not that they needed any help as JG's dice luck had changed, along with his dice (he’d swapped sets). The wolves were swiftly despatched, Hruthnor lopping the head off one (8 damage on a wolf that only had 7 to start with) and Lannius chasing one badly-wounded one (1hp left) across the room until it turned in the far corner and went for him. Bad dog. So, to sum up, Wolves lost on the replay. (Okay, English football joke, apologies for the parochialism). Well, after that, there was nothing to do apart from break open the clay jars. Imagine JG's delight when he found one of the four tokens therein. He remembered who had told him about them (spirit-possessed skeleton in room 3) and knew how important a discovery this was. In fact a high-five between player and DM was in order. Father-son bonding moments are good. From there, they made their way back up the corridor and down the one that leads to room 7. Halfway down the corridor, I rolled for wandering monsters and up came two giant centipedes. A further boost to JG's confidence as Hruthnor and Alurax pinned the beasties to the floor with a crossbow bolt and an arrow respectively. And it was at the threshold of room 7 that I chose to halt it for this week. Next week, I need to put on my poet's hat again and devise a rhyme for the nymph statue which waits for them in room 6, which should give them clues as to how to handle these two rooms. What was learned – JG experienced character death for the first time. Although he cried, as I knew he would (a heart-wrenching moment for me as well, thinking 'Is he up to this?') I think that it made him a stronger player. The demise of one of his favourite characters fired him up for revenge. In recent conversations that I’ve had with him, he seems totally reconciled to the notion that a character death in what I’ve taken to calling ‘real dungeons’ as opposed to the soft-cornered Training Dungeon merely means a new one has to be rolled up. And that’s cool. The party also encountered undead for the first time, and I had to explain the process of turning. With the second group of skeletons, JG decided to have Elise the cleric weigh in with her hammer rather than try and turn them. He seems to have cottoned on to the fact that blunt weapons are the best thing to use against skeletons, but not the crucial part that clerics play in the battle against the walking bones. JG still has the urge to hurtle off with low HPs and a lack of spells. And on this occasion, he split the party, to his ultimate detriment. But that’s what the Training Dungeon is all about. Open the gates! Lower the drawbridge! 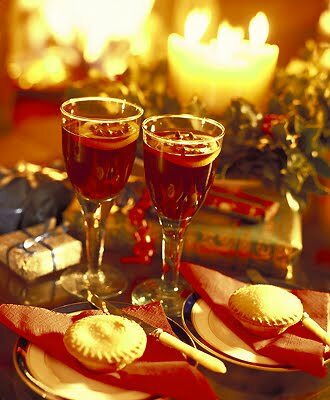 Bring out the best wine! 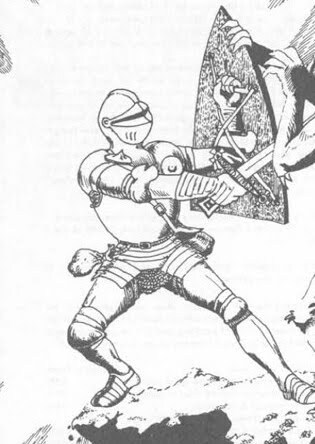 A Paladin in Citadel has joined the followers of Daddy Grognard! Welcome, my friend. I hope that you'll find this corner of the blogosphere to your liking. I have plenty of (hopefully) interesting stuff lined up and have reciprocated your kind gesture by becoming one of your followers in return. All the best to you and may your +5 Holy Avenger never miss! Which one would win if they had a fight? I've always thought Demi would clinch it, but perhaps you have different ideas. Why not let me know what you think? And put forward your suggestions for next week's Fight Club. Seriously dangerous monster of the week - the Ki-Rin. 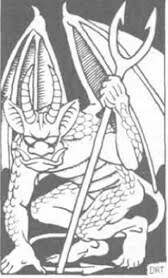 I've never used this, and I can't recall a dungeon in which I've ever encountered it, but I was looking at it the other day, just idling through the Monster Manual as you do, and read that it could cast spells as an 18th level magic user. It also has the inherent ability to call lightning, presumably at 18th level also. This, if you check the spell out (druidic, I think) gives 20d8 of lightning damage, which is an average of 90 hit points, but it gets worse because any spell that has to do with the sky (err, methinks lightning counts) is doubled in strength. That's an average of 180 hit points in one strike. Okay, so it's not as bad as the 360 points of damage that all Tiamat's heads can do to you if they breathe on you at the same time and you fail your save, but pretty harsh. And while you're busy smouldering (that assumes you make your save), it then casts the same spell from its list of actual spells it can do that day. Or a wish. Or meteor strike. Or whichever 9th level spell it fancies. Basically, if you see a Ki-rin coming and it looks angry, run. Anyone else got a little-known monster that can do some serious damage, and really ought to be better-publicised? Well, I thought, what better game for this than D&D? JG listens and concentrates for three hours on a Sunday afternoon – surely that proves it works. With this in mind, I brought up the subject of the great game, explaining what it was and telling her how it could benefit children, promoting group co-operation, creative thinking, mathematical skills, building confidence, art and craft, etc, etc. “Oh…right…” was her somewhat less than enthusiastic reply. I could see in her eyes the desperate urge to move on to the next subject as quickly as possible. If I'd ever wanted to start a school-based D&D group (which I do), this was one teacher who was not going to be waving the banner for me from the touchline. I can’t be the only one who gets more than a little red-faced when he has to explain D&D to non-gamers. It happened at the library when I had designed a poster to try and attract new gamers. I almost find myself making excuses for just how geeky I think I'm sounding. Does anyone else find themselves turning red or feeling awkward when the subject of D&D comes up in non-gamer company? Greetings and a hearty Yorkshire welcome to you, Christopher B. 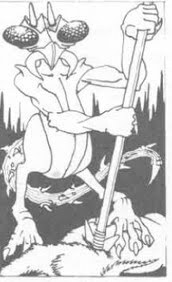 Dig your avatar - mind flayers are almost a good reason to use psionics in D&D but really, no reason is good enough to use psionics. Still, just reading about ceremorphosis makes me think "Yup, there's a dungeon in that somewhere. Almost as gruesome as the method I could imagine the Meenlocks using to convert humans" (and I'll be blogging on that one later, when the kids have gone to bed). One of our DMs back in the day had a brother whose hair was a very vivid orange, and needless to say he got nicknamed either Duracell (the one with the copper-coloured top) or the Rust Monster. So, in the spirit of fond nostalgia on which this blog is based, Chris, I welcome you. I hope that my little corner of the blogosphere is somewhere that you will pop by from time to time. Oh, and neat caption by the way! 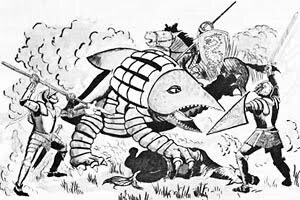 My suggestion "Yeah, but think of the XP"
Okay, so now there are eight of you - Ze Bulette from Dungeons and Digressions, this humble blog welcomes you. Sunday afternoon, about three o'clock. All the books were out, the dice bags were ready, two shiny new sets sent to us by my good buddy Old 4 Eyes, and my trusty set, no two alike, carefully kept over the years and now ready to roll again. My son, Junior Grognard (hereafter referred to as JG) had his character sheets, pencil and figures out. I had written the following introduction for him, setting the scene so that the notion of the VR Training Dungeon would be explained. In the end, it didn't get used, because I judged that he was eager to get into the dungeon and reading this would slow it down. I include it here for interest. You are villagers and peasants in a small settlement a few days' travel from the city of Stonegarth Hold, which some of you have visited once or twice on the great market days. The city is a cross-roads for travellers from many lands, warriors and mystics, magicians and priests, barbarians and - on rare occasions - elves and dwarves. You have seen adventurers pass through your settlement on many occasions, but these tough and hardy fighters and magicians seem to come from another world. They have no time for ordinary folk like yourselves - their minds are filled with tales of monsters, danger, treasure and mystery. Stories that they tell at the local tavern, where you have eavesdropped on those rare occasions when you could get away with it tell of lost temples, brave knights, dragons from thousands of years ago, something called The Empire of the Snake (everyone shushes anyone who mentions that), mighty wizards, treasures worth thousands of gold pieces, things that refuse to die and stalk the distant lands. If nothing else, these stories give the adventurer who tells them a round of free drinks. You and your friends play out these stories for days afterwards, all the time wondering if they are true, and what the life of an adventurer is really like. It must be more exciting than endless days of sheep shearing, milking cows, ploughing and weeding, watching another year go by. "Enter an exciting world of sorcery, monsters and treasure"
You cannot help but wander over. An old man is busy reading from a musty old book while a curious crowd looks on. Nearby whispers about him mention Stonegarth Hold, wizards, dangerous spells and even mention of Palintor, supposedly the greatest city in the world. It's said that anyone can buy anything there - if they have enough money. All you have is a handful of silver pieces, saved over the weeks in case there is anything good at the fair. The old man glances up at you. He asks if you're interested in finding out what it's like to be an adventurer. He can see by your reactions that you would. He tells you that there is no need to worry - he can show you what you want to know and you won't even have to leave the village. You look down glumly at the silver coins in your hand. He smiles and tells you that whatever you have, that's how much it'll cost. You and your friends glance at each other. It has to be more exciting than watching old Gilessa and her boring conjuring tricks or Ref the tinker and his so-called singing dog. He invites you into the cart, where there are several dusty old chairs, and gestures for you to sit down. Then, from a cupboard he takes a bundle, wrapped in black cloth. You wonder what it is. He closes the door of the cart and tells you to get ready for adventure. Then he takes off the cloth. He holds in his hand a glowing orange gem the size of a child's head. As you look at it, the light gets stronger. You cannot pull your eyes away. Suddenly, there is a flash and when you can see again, you find that you are no longer in the cart, but on a hillside. Nearby is what looks like the entrance to a tunnel, surrounded by old and moss-covered stone. You look at your friends, who are now wearing armour and strange robes, carrying backpacks and swords. Dream or illusion, magic or whatever - it feels so real and you decide to see what is inside the tunnel entrance. Not going with that, I quickly laid out the first corridor. The party set off from the entrance and soon reached a crossroads. They turned right, towards a large room. This was keyed as being the haunt of a band of goblin raiders but a die roll indicated that they were out and had left only a small, 4-strong presence. JG wanted to steam in and attack, but I had Alia the MU mention that she had a sleep spell and thought that would be better to take them out. Which she did - zonk, down they went. Alurax ran in and killed all four. He was delighted when I informed him that he had garnered 20gp of coins from the mattresses and sacks scattered about the room, less so when he realised, after I had pointed it out, that there were mattresses enough for 21 goblins and they had only encountered four so far. They returned to the crossroads, went straight across and this time headed down towards a smaller room, where they found a metal grille in the floor and noticed that something was glinting and glittering below. 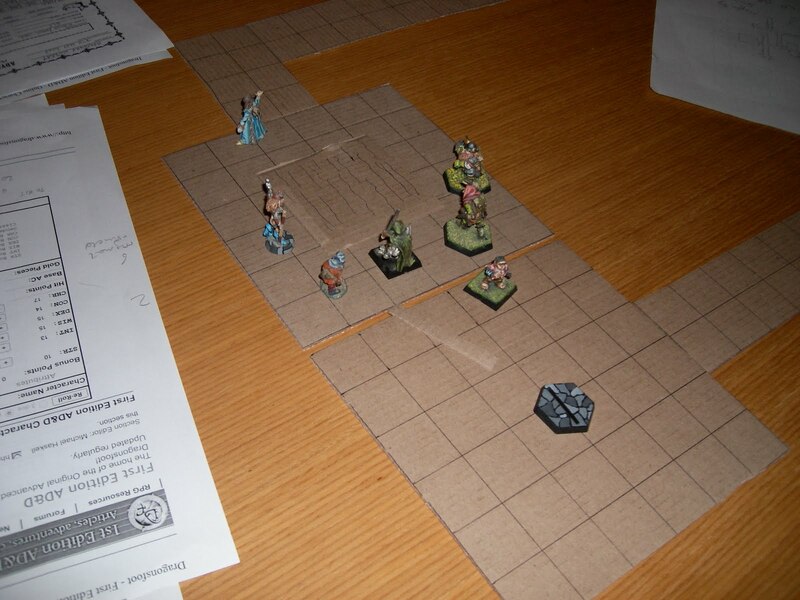 They took so long trying to work out who was going to try and open the grille and how it should be done that I decided to do some wandering monster rolls and sure enough, a group of 5 kobolds came marching up the corridor from deeper into the dungeon. Alurax and Akurath, the dwarf with the sword launched into the attack. It didn't take long - I think JG rolled a 20 on his second roll of the attack dice and Akurath's rolls were similarly good. The dwarf took 4hp of damage from a determined spear thrust by a kobold that had dropped to 1hp on the first round but had hung on in there and refused to die. He fell eventually. The party made its way down the way the kobolds had come to another turn-off. I noticed that they seemed to have completely forgotten (in the excitement of their first melee) about the glittering gems below the metal grille. The spiders will have to wait for their dinner. They arrived at the turning, and saw two doors down the side passage. The party chose the further of the two. Lannius checked for traps and found none - Alurax then kicked the door open to be confronted by an old man in chains. As they came towards him, he fell apart and his hands and skull launched their attack. Alurax dodged and struck and one hand was shattered into its component bones. Unfortunately, even with AC2, Lannius still got hit by the second hand and his CON started to drop. Meanwhile, the skull headed for the door, keen to get in on the action. Outside were Hruthnor and the hobbit, Zhastar. The latter cast a protection from evil and the skull decided it wanted a taste of dwarf instead. Hruthnor was having none of this and swung his battle axe, scoring a hit and doing 8 points of damage. As the skull only had 6 to begin with, it was well and truly shattered. Alurax then managed to get a hit on the hand fastened around Lannius' neck but not before the thief had lost another point of CON (down to 11) The hand succumbed and the party withdrew to congratulate itself and regroup. Behind the other door was a manacled skeleton, wearing the remants of stout adventuring gear. This provoked immediate suspicion, considering what they had just faced, but it swiftly became apparent that there was no danger. With glowing eyes, it rose up and explained that it was the mortal remains of an adventurer that had come to the dungeon seeking the treasure hoard at its heart. 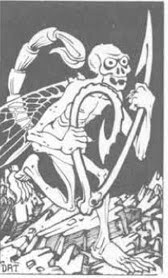 But death was his only reward and in return for the party swearing to give his bones a proper funeral so that his spirit could move on, he told them that they needed to gather four tokens, currently scattered around the dungeon. Only these would enable them to claim the treasure. This was like a red rag to a bull for JG and the door flew open to a determined shoulder from Hruthnor. At once, the sturdy dwarf took 5hp of damage from two magic missiles. Our doughty adventurers returned fire, and the 3rd level MU took damage from a crossbow bolt and an arrow. He was preparing to web Alurax and Hruthnor but this spell was spoiled by the hits. As the bow has a rate of fire of two per round, I ruled that Alurax got his second shot in at the end of that round. He rolled great die rolls and the MU thudded to the floor, a veritable pin cushion. The dead magic user's companion, a thief had been firing at Hruthnor without success and as the party swarmed in, he dropped his weapons and surrendered. JG wanted to kill him but I explained that NG characters do not kill unarmed prisoners. He grudingly accepted this but cheered up when I revealed more gold pieces and a magic book were amongst the pickings from this particular encounter. Since there are three MU or MU multi-classed characters in the party, there could be some resentment at the fact that Alurax has claimed it. Were this a multi-player dungeon, the party dynamics could be quite intereting. With the captive thief in tow, they filed out into the wind tunnel again. By this time, the light spell had expired and they were in darkness again, but of course the wandering monster rolls decreed that two giant rats were approaching from behind. Alurax, being an elf had infravision and launched into an attack, using his bow and killing one, whilst Hruthnor took out the other in a couple of rounds. At the end of the wind tunnel, the party relit their torches and headed left, down towards a doorway. They made it with no further encounters and realised that it was an empty store room. As it was approaching six by now (real time) I suggested that the party should use this as their base for recovery and regrouping, which was accepted without demurral. I was delighted that it had gone so well; I could have made a right fudge-up of the whole thing and put JG off D&D for life, but he seemed to be hooked. Reflections - JG picked up the concepts well, although I noticed that handling seven characters was overwhelming him with paperwork, so for next time, I suggested that he should have uppermost only the character sheets of the two at the front. I had to help out a few times, pointing out things on the character sheets, and occasionally correcting him when he picked up the wrong dice for damage (the fact that his seet was all the same colour was a disadvantage here as I couldn't say 'No, the D8 is the blue one'). He got rather demoralised when Hruthnor took the 5hp of damage from the magic missiles (assuming that the doughty dwarf was going to die), but the death of the magic-user seemed to cheer him up. I thought that the three hours we played was a good length for JG and his concentration. Considering that his teachers tell us he has problems concentrating in class, I found this an encouraging sign for the benefits of playing D&D. 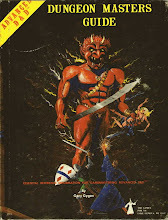 I am including some links to forum posts on Dragonsfoot, where other parents have been running their kids through adventures. It was reading logs such as these that convinced me that the time was right for JG. Also, if anyone knows of a way to import pdf images into a blog, could they advise? Or how to convert pdf to jpeg? Thanks, otherwise I can't see how I can get the maps in. Wow! Seven followers! The latest is Al from Beyond the Black Gate. Healing in a Low-Magic Campaign (I passed this on to my good buddy Old 4 Eyes, who found it very interesting). Flagship Adventure for the OSR. Skeletons in the Closet - each a grain from which a pearl of a backstory can grow. Megadungeon Design and Philosophy (I'm starting work on mine, Monastery of Doom, and this has saved me so much time and effort). Keep 'em coming - I don't know where all this creativity comes from, but thank goodness it comes! 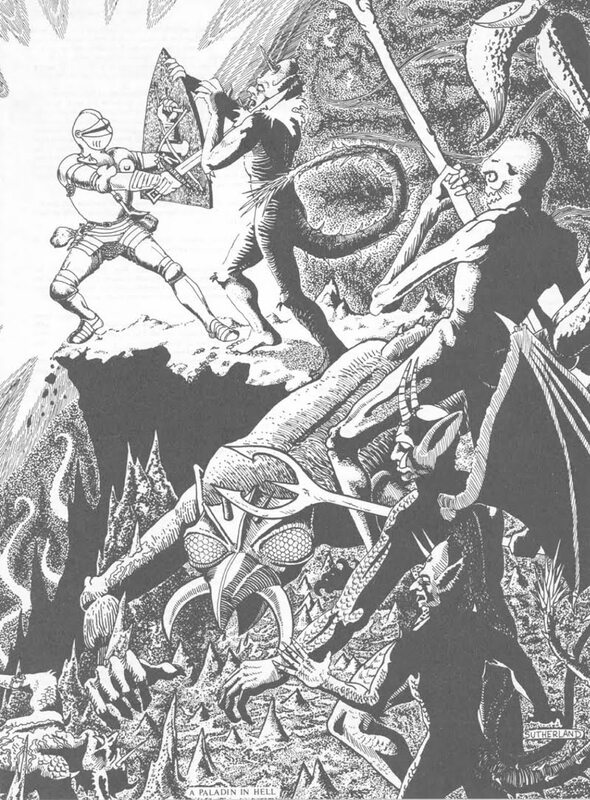 As an aside, check out James' latest post at Underdark Gazette - he's done something very handy for non-combat dungeon encounters. Hey, everybody! It's James from the Underdark Gazette! James - you are most welcome. You know the guys. You did bring the beers, right? I've just been over to your blog and it seems like a neat place to hang out. I note that you're in the process of designing your campaign world. In blogs to come, I'll be introducing my campaign world and the way it's evolving, thanks to a massive input of ideas and creativity from many sources out there in the blogosphere. It's very sandbox. I hope to have the first Training Dungeon session report soon - 6.5 year old wreaks havoc with battle-axe! I look forward to reading more about your family campaigns. Who wants to go for pizza? Hey, two more followers! Welcome, R.Lawrence Blake and The Rusty Battle Axe! I'll just put the kettle on. Hope I've got enough chairs. Welcome, James Raggi and Chgowiz! It's great to have two giants of the OSR following me. I feel rather humble. Okay, I feel in awe. Previously, I discussed the philosophy of the training dungeon. Having written it up and with a very excited 6.5 year old waiting, it was time to get a party together. I thought we would need a cleric, a couple of fighters, a thief, a magic-user and of course my son's character. He'd rolled up a pretty good set of stats, (S 17 I 16 W 13 D 13 C 12 Ch 9) and rather than just make him a fighter, I thought that he could use the high intelligence and make him a F/Mu. Of course, the logical choice after that was to make him an elf, since the character level limits are better for elves than half-elves (check in the PHB if you don't believe me). The rest of the characters were rolled up on the Dragonsfoot 1e Character generation system and here they are, in all their glory. Zhastar Kutulnar, halfling cleric. HP 2, AC6 - I reckon he'll be the first to go. 3 1st level cleric spells to be chosen at the start of the session. Hruthnor Notchblade, dwarven fighter - HP9, AC5. 2 hand-axes, 1 battle axe, light crossbow. The tank of the party. Alia - human MU, HP 2, AC10. 2 daggers, five darts, one staff. Lannius Light-finger, elf thief. HP 5, AC 2 (yes, that's right. Studded leather and shield, dex 18 gives him -4 defensive adjustment). Short sword, dagger, bow. Akurath Bladestrong - dwarf fighter. AC 5, HP 10. Tank 2 - the word meatshield never even entered my head. Longsword, battle axe, lucern hammer. Use him till he's dead, then throw him at the enemy for 1-6 damage. I might use one or other of the characters to perhaps channel sage advice, if needed, but it's up to my son to decide if he wants to take it. And so let the mayhem begin... place your bets on how long before the Training Dungeon claims its first TPK. 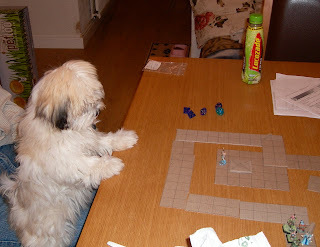 So, 6-year old, wants to do D&D. However, there is a problem. Small person, like most other small people (and if you've got a small person, you will know this) tends to get easily disheartened if things don't go his way. What could be more disheartening than a TPK two rooms in, caused mainly by his total lack of knowledge of the game mechanics? 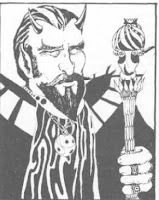 I know that many of us have experienced TPK before and just picked up the 3D6 and gone off and rolled up another character (or now, in this more technological age, logged on to the Dragonsfoot character generator), but then we're not six years old and we can contextualise character death a lot easier than small boys. Solution - create an environment in which he can learn the mechanics of the game whilst at the same time not losing a precious character or two due to...how shall we say, unfortunate happenings? Thus, the training dungeon. The concept was that the characters are running through what, for the want of a better term, is a VR dungeon. For them, it's totally real, but each time a character dies, he reappears at the start of the dungeon, intact and ready to restart the adventure. They get no experience points, because they don't face real death. What they do is face situations where their knowledge of the combat system, saving throws, spells and class abilities is expanded and advanced. I sat down and listed out all the things that needed to be learned and then drew up a list of situations in which those things could be introduced. Save vs. DEX? A narrow ledge over a diluted green slime pit, with a DEX throw needed every ten feet. Cleric needs to learn about turning undead? Rooms of zombies, skeletons and ghouls. The virtues of carrying rope, iron spikes and hammer? Access to the lower levels by 40' shaft only. And what better introduction to combat than rooms full of goblins, kobolds and orcs, ready for it and tooled up? Thanks to Gozzy's map generator (www.Gozzy's.com - recommended) I soon had three levels and then started stocking them with the created situations. Eventually, I had a 38-room dungeon ready for its first influx of characters, with one aim - explore! Because that's what it's all about. It's not for nothing that the first B module is called In Search of the Unknown. Exploring is fun, exploring is scary, exploring is not safe - it's like Forrest Gump's life: you never know what you're going to get. Remember when we were young. And shone like the sun...(oops, too much Pink Floyd). And being scared was the most fun we could have. I can still remember my first dungeon and I should think that most of us can. However, we got to experience our first exploration in our early to mid teens. My son is a lot younger than that, and needs something that little bit safer to ease him into it. I think that the Training Dungeon is it. I could have waited until he was in his mid-teens, another six to eight years. But by then, I'd be in my fifties and he might be lost to the X-box and the Wii. I can't risk that, so that's why I can't wait. Francis Xavier, a Jesuit leader said "Give me the child until he is seven and I will give you the man"
Grognards, the man has spoken.